jortion goes down one tube, is reflected twice by the total reflection prism P through the other tube, and passes, after necessary reflection, into the observing telescope. The other ray pursues the contrary path, and we see interference fringes in the telescope as before, but enormously brighter and more definite. This arrangement made it possible to make measurements of the displacement of the fringes which were very accurate. 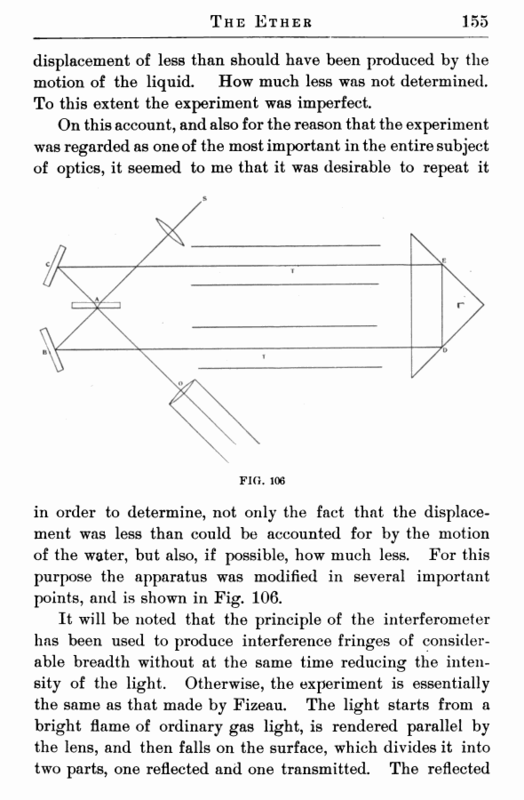 The result of the experiment was that the measured displacement was almost exactly seven-sixteenths of what it would have been had the medium which transmits the light waves moved with the velocity of the water. It was at one time proposed to test this problem by utilizing the velocity of the earth in its orbit. Since this velocity is so very much greater than anything we can produce at the earth's surface, it was supposed that such measurements could be made with considerable ease; and they were actually tried in quite a considerable number of different ways and by very eminent men. 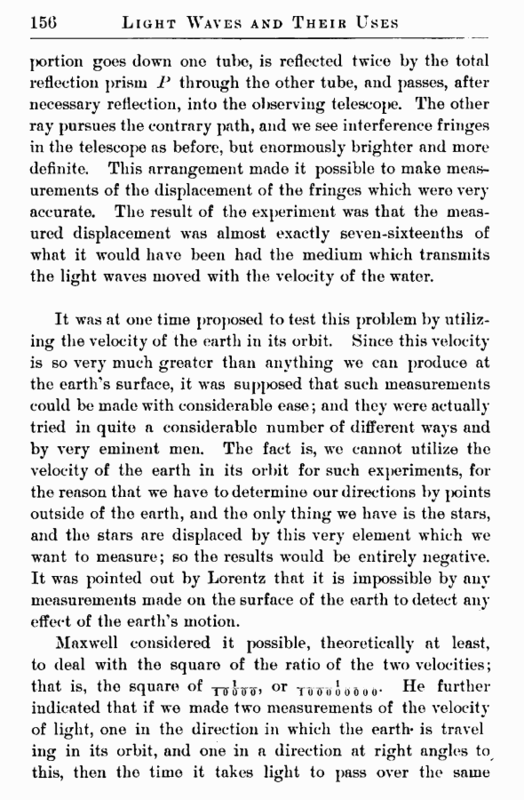 The fact is, we cannot utilize the velocity of the earth in its orbit for such experiments, for the reason that we have to determine our directions by joints outside of the earth, and the only thing we have is the stars, and the stars are displaced by this very element which we want to measure; so the results would be entirely negative. It was pointed out by Lorentz that it is impossible by any measurements made on the surface of the earth to detect any effect of the earth’s motion.